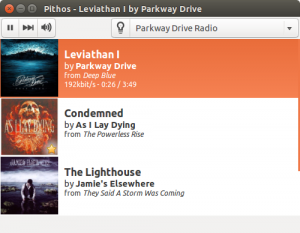 An all-singing, all-dancing new release of open-source Pandora client Pithos is now available for download. Music streaming service Pandora is only available in the United States of America, New Zealand and Australia. As a Brit, I am not familiar with it, and I can’t test how well this app works. But what I can do is re-parrot and repackage the changes listed in the release notes on the project’s GitHub page. The well known radio app, Pandora has added an ‘extensive’ set of keyboard shortcuts, fixes to a whole lot of bugs, and it now ships with upgraded MPRIS support, among other changes. Users of Last.FM will be overjoyed to find out that tracks are now showing up as “Now Playing” on the website of the music logging and also that the issues with album art have been sorted out. Pithos 1.2 is available at their GitHub project site, but just don’t forget that it will be shipping as source code and thus, it will need compiling. If you’re not too deep in the geeky stuff the official Pithos PPA has made available the latest release for Ubuntu 16.04 users and you can just download the .deb installer directly from here. Are you interested in playing Pandora from the command line? If yes then you should heck out Pianobar.